If you wish to designate your gift to a specific disaster, you may do so at the time of your donation. Monetary donations can be made directly to The Salvation Army of Greater Birmingham – PO Box 11005, Birmingham, AL 35202 or by calling 205.328.2420. Or, you may call 800-SAL-Army (725-2769) 24 hours a day. When needed, The Salvation Army will request and accept both corporate and private in-kind donations in support of the disaster relief operation. Specific items needed will be identified based on the type of disaster. Bulk donations of a single product such as bottled water, personal hygiene items, cleaning supplies, and building materials may be accepted. All donations must be properly packaged, shrink-wrapped, on pallets, and labeled. Donors are asked to cover the cost of shipping in-kind donations to the receiving location. 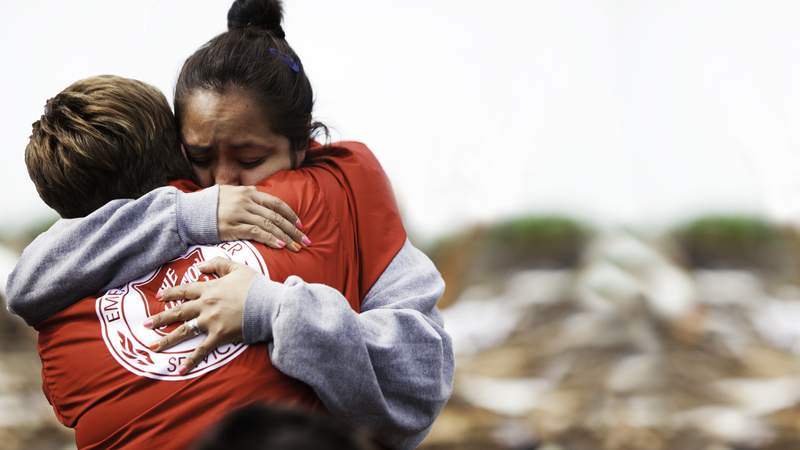 When tornadoes, floods, fires and other disasters strike, The Salvation Army provides critical services to ensure survivors have the support needed to rebuild their lives. While every disaster is unique and creates its own special needs, the core of The Salvation Army’s disaster program consists of several basic services. And while these services address many of the typical needs of a disaster survivor, Salvation Army disaster relief is also flexible. Our services are adapted to the specific needs of individuals and communities and scalable according to the magnitude of the disaster. Since its charter was enacted in the United States in 1899, The Salvation Army has provided emergency services to individuals and communities affected by disasters and other catastrophic events. The Salvation Army’s first major disaster response operation was in 1900 after a devastating hurricane hit Galveston, Texas. The hurricane killed more than 8,000 people and obliterated more than 3,600 homes, nearly half the city. National Commander Frederick Booth-Tucker ordered Salvation Army officers from across the country to the stricken city to provide spiritual comfort and practical aid to the survivors of the storm.Since then, The Salvation Army has been on the scene of thousands of disasters honoring a century old commitment to serve those in need, at the time of need, in the place of need. In 1970, federal law reaffirmed The Salvation Army’s authority to provide disaster assistance with the passage of the Robert T. Stafford Emergency and Disaster Assistance Act, which also created the Federal Emergency Management Agency. Attend the required “Introduction to Emergency Disaster Serves and Disaster Food Services: Handling and Delivery training courses, plus additional courses for your assigned specialty area. Contact our Volunteer Coordinator, Elaine Anderson, Elaine.Anderson@uss.salvationarmy.org or 205.328.0743 for more information.